TOKYO: A strong typhoon barrelled toward Japan’s northern island yesterday after churning over parts of western Japan already hit by deadly flooding last month, but while transport links were disrupted, injuries and damages were limited. Typhoon Cimaron made landfall late Thursday and passed over the Japanese archipelago overnight, bringing winds of nearly 200 kilometres per hour and dumping up to 600 millimetres of rain in 48 hours, according to the Japan Meteorological Agency. The typhoon was moving northeast over the Sea of Japan (East Sea) yesterday afternoon and forecast to make landfall again on the northern island of Hokkaido later in the day, although its strength had declined significantly. 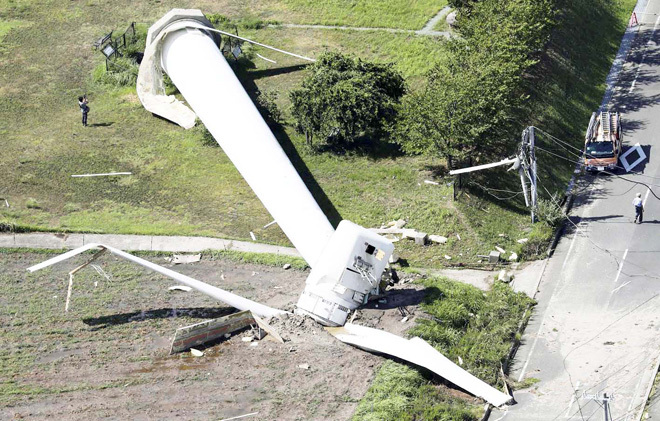 Television footage also showed a 60-metre wind turbine felled by gusts on Awaji island, western Japan, crushing two nearby power pylons. The storm left nearly 100,000 households without power and forced airlines to scrap around 300 flights on Thursday and yesterday. Bullet train services in the region were temporarily cancelled although they were running again yesterday morning. “But the number of people advised to evacuate has declined dramatically and is likely to fall further now,” an agency official told AFP, adding that at least 77 houses and buildings had sustained damage. Officials warned citizens to be vigilant for flooding, landslides and high waves, with meteorological agency chief forecaster Ryuta Kurora saying the typhoon could bring ‘multiple hazardous phenomena’. Next Article Should we expect more from the Sarawak Foundation?